The Gray Squirrel is perhaps the most familiar of all squirrels! Gray Squirrels are primarily forest dwellers, but have adapted to the encroachment of humans by becoming part of large city parks. You can often see them scurrying about, foraging for seeds, buds, and nuts. Dr. Jungle says..."Rocky sure likes his pizza!" Gray Squirrels are native to North America, found mostly in the Eastern United States. They were also introduced to other areas of the world, such as Ireland, South Africa, and Great Britain. Their homes are in tree cavities or in bulky water-proof twig and leaf nests built in tree branches. They also dig burrows in the ground, but these are for food storage. They are generally a quiet little creature, but if alarmed will emit a harsh guttural "bark", flipping its tail with each squawk. Gray Squirrels eat acorns and hickory nuts throughout the year, though they may eat buds, tender twigs, seeds, and insects when the weather permits. Unlike their very active smaller cousin the American Red Squirrel, which needs large amounts of seeds and nuts to see it through the winter, the Gray Squirrel can subsist on a rather small quantity of buds and nuts, and will often sleep soundly through periods of stormy weather. They are not quite as fearless as the American Red Squirrel in the presence of humans, but will soon overcome their caution and come out to visit if you sit quietly. 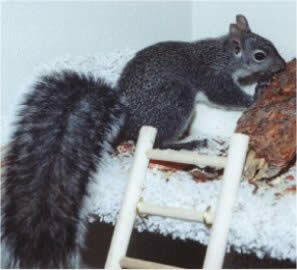 Description: Eastern Gray Squirrels are 17"-20" long, and 8 1/2" - 9 1/2" of this length is their bushy tail! There are marked color variations in this squirrel, so at one time they were described as four different species, but today they are all contained in one valid species. populations by shooting them for sport, or poisoning and trapping them. hour or so before sunset. Experienced squirrel owner, currently looking for a baby/young female eastern grey squirrel in or around the Maryland area. Willing to drive out of state for pickup. If you are a breeder or have any leads, please let me know. Do you still have the squirrels for sale and do you ship. If so what is the cost to ship?